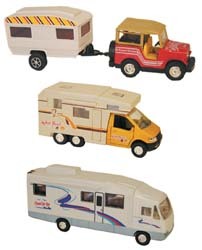 Mini Motorhome has working slide out awning as well as opening passenger and coach doors. Pull back action propels RV without batteries. Dimensions 6 1/2" L x 2"W x 2 3/4"H. Diecast metal & plastic construction on all toys. Hitch S.U.V. to Trailer and take off. Pull back action propels S.U.V. without batteries. Dimensions 8 3/4" L x 2"W x 2 3/4"H.
Diecast metal and plastic construction on all toys.